Follow the steps of the1859 Gold Rush, travel up rugged Clear Creek Canyon and look for the state mammal the Big Horn Sheep on the steep canyon walls. Visit the historic town of Central City and admire the architecture in what was once considered the richest square mile on earth and hear the stories of miners and their way of life. Then visit a Real Ghost Town from the mining boom, then enjoy the scenic mountain views as you head over to Historic town of Georgetown where you will tour a real Gold Mine and learn about the mines history and modern day mining techniques, you can even try your luck at striking it rich! See Learn and Explore the Wild West on this fun Colorado Gold Rush Tour. You tour will begin with a pick up at the Historic Union Station in Lower Downtown Denver. Your driver/guide will pick you up in a clean air conditioned Ford Transit Touring van with only 9-12 passengers per tour. You will make your way West to the beautiful Rocky Mountains and follow the historic 1859 PIkes Peak or Bust Gold Rush route. You will pass by the historic town of Golden as you enter the rugged and steep Clear Creek Canyon. While in the canyon look for Big Horn Sheep our state mammal on the canyon walls. You will pass by Blackhawk before you arrive in the historic town of Central City where the historic architecture and colorful stories of the mining days will delight. Next you will head over to a Ghost Town where there was once a booming population and now is home to only a couple people. See historic mines and their remnants of the past abandoned and left behind for other opportunities. Then you will travel over to the historic mining town of Georgetown enjoying fantastic mountain views along the way. In Georgetown you will tour a real gold mine and learn about the mining days of the past and present. During this 45 minute tour of the mine you will walk 1,000 feet into the mine and see real gold and silver veins, and experience what is was like to be a hard rock miner in the 1860's. At the end of the tour you will have an opportunity to try and strike it rich with your own discovery of gold or silver. 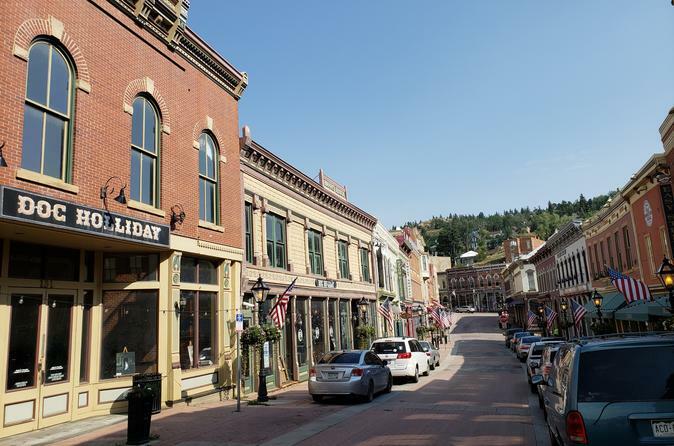 To end the tour you will have time in Georgetown to grab a drink, purchase a souvenir or just enjoying the quaint historic main street of this once booming silver mining town before heading back to Denver where your tour began. On this wonderful wild west tour, you will see, learn and explore Colorado's colorful mining history and scenic mountain towns.